St. Juan Diego Cuauhtlatoatzin is the humble indigenous man the Virgin of Guadalupe appeared to starting December 9, 1531. It was Juan Diego’s cloak (tilma) that the image of Mary is imprinted on and he who is seen next to her in most every image. 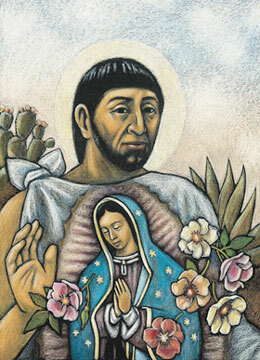 In 2002 Juan Diego became the first indigenous American saint. Mary addressed herself specifically to an indigenous man while making her image available to all New World residents representing the formation of a new nation and race. His role highlights the rights of indigenous people to have their cultural traditions and way of life honored and protected. His impact is felt daily in San Miguel de Allende in the preservation and celebration of indigenous culture.